This article is intended to describe how to utilize the Course Archive file once it is downloaded onto your computer. In order to use the Course Archiver Tool, please see this help document: Course Archiver Tool. 1. Open the downloaded course archive file on your computer (typically found under Downloads). 2. For PC users, click "extract all" to open the zip file. 3. Click on the index.html file. 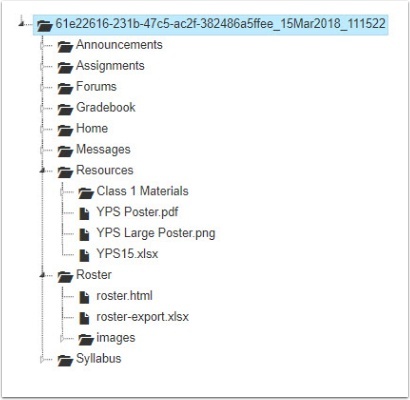 Once you open the index.html file, you will see a folder structure for your v2 course. Each folder can be expanded to show the contents. NOTE: To obtain additional student work from this course, please use the Student Work Archive Request form.